The PlusQuip range of workshop test equipment has recently expanded with the launch of several new products including an Electronic EGR, Throttle Body and Actuator tester, and a Dynamic DC Volt Probe. The EQP-115 Electronic EGR, Throttle Body, and Actuator tester is one of the few testers available that is capable of accurately driving both DC and Pulsed Width Modulated (PWM) components on today's complex vehicles, both on and off the vehicle. This versatile test unit is capable of driving a variety of components, to quickly check for complete movement or any seizing during operation, and monitor the current draw during all operating cycles on its integrated digital read out. Typical common vehicle components that can be tested include Electronic EGR’s, and position sensor monitoring during actuator operation, and Electronic Throttle Bodies allowing for the integrated TPS unit to be tested during the throttle body operation. Due to its 0-40Amp delivery capability the EQP-115 can accurately drive actuators and motors within that high current range. The EQP-115 can also test the variable intake manifold actuator and intake air control (IAC) actuators (both on and off the vehicle), as well as the supply pump and electric control regulators for direct fuel injection and common rail diesel systems. It also handles EVAP control solenoids and HVAC blower motors (both on and off the vehicle), as well as cooling fan testing at varying speeds and other actuators and motors that can be operated by PWM or DC within the current range. The EQP-028 Dynamic DC Volt Probe is a high visibility, simple to use, one handed dynamic voltage testing probe. It indicates Power and Grounds and tests the circuit’s ability to deliver current and identify loose, corroded or broken wires. It allows the user to capture intermittent spikes or drops in voltage, or take Voltage snapshots in any mode, any time. The EQP-028 Dynamic DC Volt Probe tests Dynamic voltage drop and includes a glitch capture mode. It operates in several modes including Circuit Loading Mode, testing the circuit's ability to delivery current (voltage drop testing), and Glitch Capture Mode, displaying intermittent increase or decrease in voltage. It is also able to take a Voltage Snapshot, or simply measure DC voltage in Normal Mode. 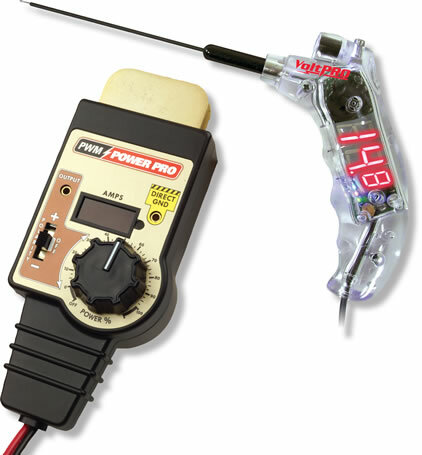 The EQP-028 Dynamic DC Volt Probe features Red and Green LED's to clearly identify power and ground, and is computer safe, suitable to use on complex vehicle systems.